We all wonder what kids are being taught about agriculture in schools today. In New York City, one high school has a complete 4 year agricultural education program with a very good percentage of graduates going on to careers in ag. In this week’s program we’ll hear all about it. The idea for this week’s program came from an announcement by Eastern NAMA and Gibbs & Soell. 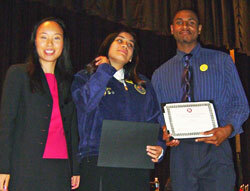 They’ve awarded two $500 scholarships to John Bowne High School students, Katherine Vegas and Nigel Calderon. They’re pictured with Eastern NAMA President Catherine Wang, Gibbs & Soell (left). I interviewed Catherine and also Steve Perry, John Bowne High School Assistant Principal who describes the program and the support they receive from the community and faculty. The grants, sponsored by NAMA and Gibbs & Soell Public Relations, were presented to Vegas and Calderon for their outstanding scholastic achievement and contributions to the FFA program at the school. Making the presentation was Catherine Wang, NAMA Eastern Chapter president and an agribusiness communications professional at Gibbs & Soell. John Bowne High School, located in Flushing, N.Y., has a specialized agriculture program that is nationally recognized as an outstanding urban agricultural education offering. The school’s agriculture program is the most extensive of its kind in the state. A graduating senior of the animal science program, Vegas has been an FFA member for her entire four years of high school. She plans to study wildlife management at the State University of New York – Cobleskill. As an agriculture major, Calderon gained broad experience in animal health studies on the Small Animal Care and Exotic Animal teams at John Bowne. He plans a career in zoology or veterinarian medicine. This week’s program ends with some music from the Podsafe Music Network. It’s a song titled, “Words and Teachings” by Messian Dread. I hope you enjoy it and thank you for listening.